Ho! Ho! Ho! and welcome to Santa Rielly's Blog! Well hello there and welcome to my very first blog entry! I thought a long time about what my first entry would be here and it seemed only fitting to use this opportunity to say thank you to my inspiration in becoming Santa - My grandfather (Papa) James D. Rielly. James "Jimmy" Rielly was born in 1908 soon after my great grandparents arrived here from Ireland. Papa donned the red suit early in life. I have gotten conflicting data from my aunts and uncles (his children) and my recently passed Nana (his wife). 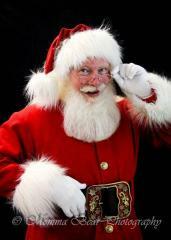 However, from what I gather he started his Santa career sometime between 1927 and 1929 - between the ages of 19 to 21. As you can see from the picture, he originally wore a Santa mask! I still can't believe kids fell for that! Later on he moved up to a strap beard, wig, and glued cotton balls to his eyebrows. His suit was nothing great; in fact he wore regular shoes most of the time. His nicest suit was made by my Mom. It was made from a simple red cotton material and bad fake fur. Years before I ever even considered becoming Santa, he told me several times that it was not about the suit or the beard. I didn't really know what that meant until much later when I donned the suit for the first time. Back then there weren't as many Santas as there are today. So I guess that's what made him somewhat of a celebrity. He was featured on several national TV shows including PM Magazine and had received literally thousands of letters from celebrities, dignitaries, and politicians. I have seen letters from President Eisenhower and Pope John Paul II. In 1979 his name was recorded in the Senate Congressional Record as "James D. Rielly – A Truly Remarkable Santa Claus From Rhode Island". Papa appeared primarily at hospitals, nursing homes, orphanages, schools, charitable organizations, and military bases. He occasionally did home visits and private parties too, but he never took money for any of his appearances. I am told many people showed their appreciation in the form of bottles of scotch, whisky, wine, etc., but the only ones that took advantage of that, were the people driving Papa to and from appearances. My Papa, the son of Irish immigrants, didn't drink alcohol! Papa didn't drive either, so when my Dad and his brothers and sisters were old enough there was never a shortage of drivers for Papa. 2007 will be my 16th year as Santa. I took up the red suit the year after he passed. In Papa's honor I take no money for my appearances and stick primarily to the same customer base – although there aren't many orphanages around these days. I have a long way to go before I get to his level, but I like to think that I am continuing his work. Before all of my appearances, I say a little prayer to Papa. I like to think that he is watching. So thank you Papa. Thank you for being an inspiration to me and who knows how many countless other children you may have touched. Next entry My second Bachelors degree in Santa Claus! Wow! That's a great story! Thanks for sharing! What a touching story. I am sure your Papa is SO proud of you. A great story! I should have known you were Irish! But an Irishman that didn't drink? Very rare indeed! My great grandfather came over from county Cork, but he wasn't a Santa, but an engineer on the Union Pacific, along with his uncles, cousins, and my father. I even have a newspaper article from the early 1900's that talked about the family working for the train line. I commend you for taking up the torch, and doing a fantastic job! This is by far, the best site on the internet, in my humble opinion! And to your grandfather's memory, I raise my glass, whatever it contains. That is a great story. I am glad that you are continuing his legacy. Wonderful story and I am quite certain he is very, very proud of you. Santa Rielly, indeed a great tribute to your grandfather. Thank you for sharing. What a great story Mike, you are surely following in his foot prints for it is as he said "it isn't about the suit". You have a heart and it is easy to see that what your grandfather meant is that it is what is in your heart that matters and the dedication and hard work that you put into ClausNET and the desire to keep the dignity of Santa something special shows each and every day. Thank you Mike.